Hello there! I’m Ron McIntyre, Stephanie’s blogging guest for this segment. We quickly connected because of our shared passion for travel. Some people like to keep up with the Joneses; I like to keep up with Stephanie because it fulfills my inner sense of adventure and discovery. As an artist and designer, I find inspiration in my travels. It is often where I get introduced to new color combinations and explore new textures, whether through the composition of the landscape or local artifacts. All of those elements are at the core of my inventions for my company, Square Feathers. A significant part of my life has been spent exploring the world. In my mind, foreign countries have a lot to offer to quench one’s thirst for learning. I was born and raised in the United States and I feel I may have taken its beauty for granted. This particular journey to southern Utah gave me a newfound appreciation for American grandeur. My wife and I flew to Phoenix, AZ. From there, we drove 5 hours to our destination in southern Utah. It was a wonderful road trip because we watched a landscape transformation unveil before us every hour. The rock formations exhibited different layers and different colors, and it was just a phenomenal sight to witness. Our destination was Big Water, Utah, at the Amangiri, said to mean ‘peaceful mountain.’ The drive leading us to the establishment was an outing in itself. Bordering Arizona, this resort is located on 600 acres in Canyon Point in southern Utah. In one of the most spectacular surroundings I have ever witnessed, an erected concrete building surprisingly blends immaculately with the raw desert. Aman Resorts’ philosophy seeks the exclusive, whether in more remote, secretive locations, or in the guest experience. Amagiri offers a setting that is comfortably intimate, discreet, private and low key, but without compromising its highest level of service and attention to detail. What amazed me the most was that luxury was confined to very streamlined architecture and simple, minimalistic interior design. The dramatic views became an extension of any space you found yourself in; from any angle of the room you were in, you were meant to enjoy them. It was picture perfect! Concrete walls and floors seemed to have a purposeful cooling effect on what the desert was supposed to exude: scorching hot and dry weather. The perfect time to visit, it seemed, was the beginning of December. A dusting of snow added an unexpected touch to the surroundings. The air was crisp enough that we could enjoy the many lit fireplaces and outdoor fire pits throughout the resort. Nothing set the stage better for some relaxation time. A two and a half hour drive from the Grand Canyon, the iconic national park seems like the natural touristy trip to indulge in. Besides that excursion, I highly recommend a private off-road Slot Canyon tour. Slot Canyon is renowned for having the most extraordinary geological sandstone formations. These natural sculptures, formed by wind and water, have been in the making for millions of years. The three hour tour took us on an exciting four wheeling escapade in a Hummer. We sometimes found ourselves at a 45-degree angle, able to take in all of the magnificence Slot Canyon had to offer. We not only observed the sunlight shining through the curved sandstone walls, crafting patterns and shadows in many subtle shades of earthy tones, our guide also showed us some intricate hieroglyphs found on some of these walls. It was an unforgettable, thrilling experience that fed the soul! We didn’t have to venture very far to spoil ourselves with fine cuisine to satisfy the gourmets in us. 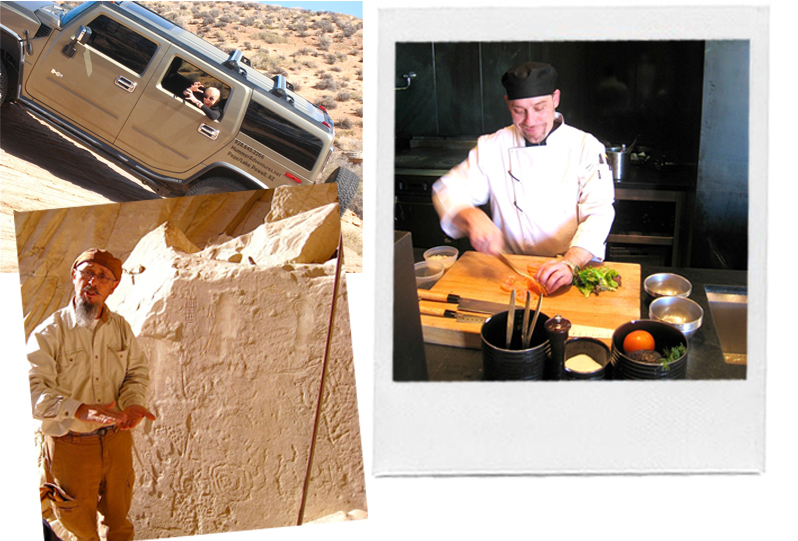 The Amangiri Resort hosts the most delicious meals in-house. With chefs at our disposal around the clock, we were always greeted with the mantra, “eat whenever you are hungry.” There’s no set time for breakfast, lunch or dinner. This is well-suited to the resort’s guests, since they hail from time zones all over the world. The higher elevation gave us an appetite, but we indulged without guilt because everything was fresh, homemade, natural, and best of all, local. The portions were sensible and the food was always elegantly prepared in such a way that allowed each ingredient to distinctively tease the palate. Simplicity best describes the no-fuss kitchen at Amangiri. From decadent creamy butter to jam, everything was handmade to please. Ron you are making me look good! Your photos are gorgeous! I can’t wait until I can get there…..been on my top ten list for a while now.